Bridgetown, Barbados: England are solid favourites although history is on the side of the underdog West Indies ahead of the first Test of the three-match series starting Wednesday at Kensington Oval in Bridgetown. Riding a wave of five consecutive victories - eight in nine matches going back to the last English summer - which includes series wins over top-ranked India and an historic sweep in Sri Lanka, the tourists appear supremely confident of overturning the disappointments of their last two Caribbean campaigns. England have only won one Test series in the West Indies in the past 50 years, a 3-0 triumph in 2004, and failed to live up to expectations in 2009, when they lost 1-0, and again in 2015 when a five-wicket triumph inside three days by the unfancied hosts at the same Kensington Oval venue resulted in a shared series. While the weight of expectation will be on the visitors' shoulders, West Indies face a daunting task to halt a run of four consecutive defeats, all within three days, on a disastrous Asian tour late last year which saw them being brushed aside by both India and Bangladesh in two-Test series. 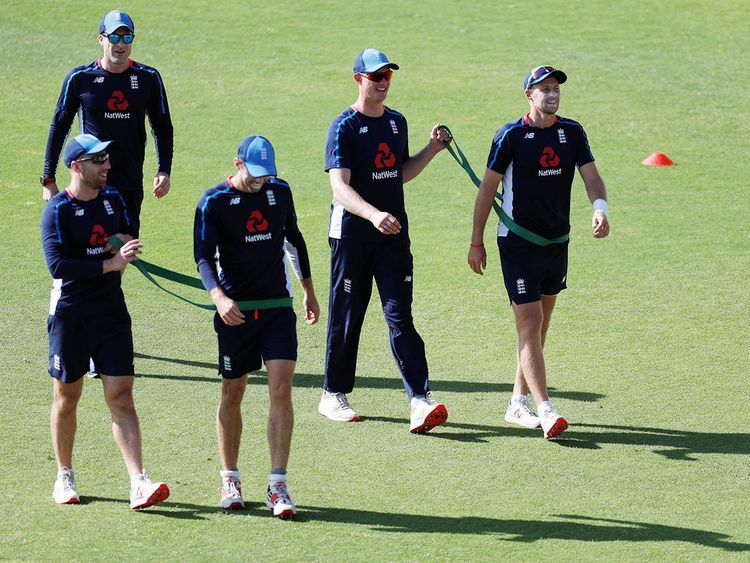 England have a settled look to their team and took the weekend off training following two satisfactory two-day matches against a Cricket West Indies XI at the 3Ws Oval just outside Bridgetown. By contrast the West Indies squad reflects both a lack of continuity in selection and the parlous state of the domestic game. John Campbell looks certain to make his Test debut opening the batting alongside the established Kraigg Brathwaite. However the 25-year-old's first-class average of 30 suggests he will face a stern challenge from England senior pace spearheads Jimmy Anderson and Stuart Broad, who need just two more wickets to lift their combined tally of Test victims to 1,000. Another newcomer in the West Indies squad of 13, 30-year-old middle-order batsman Shamarh Brooks who averages 33 but has endured a poor season so far in the inter-territorial first-class competition, is unlikely to make the final 11 especially given the return to Test duty of Darren Bravo after more than two years out of the team. Bravo's Test average of 40 and elegant left-handed style would normally make him an automatic selection except that a Twitter tirade against CWI president Dave Cameron in November of 2016 led to his alienation from the team until now. A polarising figure in West Indies cricket at the best of times, Cameron has also become the centre of an internal squabble in the regional cricket administration with representatives of the Leeward Islands making public their dissatisfaction with the process of the appointment of Richard Pybus as interim head coach for the period covering the England visit, the 2019 World Cup and the India tour to the Caribbean in July and August. Pybus is viewed as a controversial figure in Caribbean cricket circles notwithstanding the historic treble of successes in 2016 - men's and women's World T20 and Under-19 World Cup - when he was Director of Cricket. He returned to West Indies administration in the post of High Performance Director a year ago and the Englishman's appointment as coach to replace Australian Stuart Law has prompted criticism from notable personalities in the region, including two-time World T20-winning captain Darren Sammy. England's build-up to the series has been serene by comparison although in a year which includes their hosting of the World Cup, where they are expected to be one of the favourites, followed by the Ashes series against arch-rivals Australia, they can ill afford to stumble so early against a team they will be expected to defeat comfortably. On a Kensington Oval pitch expected to offer assistance to the faster bowlers, the tourists are likely to go into the opening Test with one specialist spinner in Moeen Ali while seam bowling all-rounders Ben Stokes and Sam Curran should provide ample support to Anderson and Broad. West Indies: Jason Holder (captain), Kraigg Brathwaite, John Campbell, Darren Bravo, Shai Hope, Shimron Hetmyer, Roston Chase, Shane Dowrich (wicketkeeper), Kemar Roach, Alzarri Joseph, Shannon Gabriel. England: Joe Root (captain), Keaton Jennings, Rory Burns, Jonny Bairstow, Ben Stokes, Jos Buttler, Ben Foakes (wicketkeeper), Moeen Ali, Sam Curran, Stuart Broad, Jimmy Anderson.